British MP George Galloway claims "the Zionists" sent gunmen to Ukraine to get local Jews to move to "Palestine". British MP George Galloway, who is known for his hatred towards Israel and his backing of the Hamas terrorist group, has come up with an interesting theory regarding the unrest in Ukraine. According to Galloway, “the Zionists” engineered the situation in Ukraine in order to bring “the Nazis” to power and have the Ukrainian Jews “settle in Palestine”. Galloway’s comments were made several weeks ago during his show on the state-owned Iranian Press TV. They were posted by the Middle East Media Research Institute (MEMRI). “The Zionists sent gunmen to the Maidan in Kiev to help a revolution, the cutting-edge and heavy lifting of which, was being done by actually outright Nazi anti-Semites,” Galloway claimed. “The bizarre alliance in the Maidan between former Israeli army officers [is] the most ugly alliance you can possibly imagine. [This] is part of the thinking of this… Well, if these Nazis come to power in Kiev, and they hate Jews so much, the remaining Ukrainian Jews will feel that they have to go and settle in Palestine,” he continued. 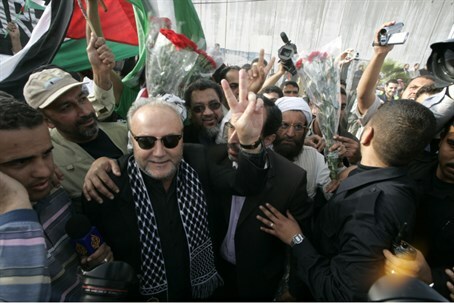 Galloway was thrown out of the British caucus in 2003 after vocally opposing Britain’s involvement in the war in Iraq. He heads the British pro-Hamas Viva Palestina, which tried to bring in an aid convoy to Gaza but was stopped by Egyptian authorities. In one incident, Galloway stormed out of a debate at Oxford University after learning that his opponent was Israeli. In August last year he accused Israel of giving Al-Qaeda chemical weapons to use against civilians in Syria.